Mystro is one of the most underrated MCs and rappers in the UK. His style is well assured, confident with a witty London edge that runs deeper than most MCs in the ever growing UK hip-hop and rap world. He has collaborated with and continues to collaborate with artists such as Rodney P, Skinnyman, Task Force and Hilltop Hoods and has dropped the UK Rap Up yearly series every year since 2009. BeatCulture.net and Urban Hit Promotions therefore decided it was right that we linked up with one of London’s best and profiled his background and influences. 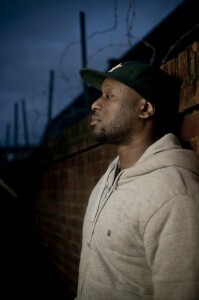 We even get to find out about his history as a jungle/drum & bass MC. What artists inspired you to make music? Was there a defining moment that made you want to make music? Yeah I nearly died from TB in a gland in my neck which was slowly closing my windpipe. Laying there learning how I was almost gone, made me wonder if I’d be happy with my life so far and I wasn’t so I decided to go for something I always wanted to do and I’m glad I did. How influential was reggae culture to you in the development of your style? Any artists? What sort of influence did jungle/drum and bass rave culture have on you as an MC growing up in London? I heard at one point you used to MC under the name BK? Well I started out rapping very young after hearing about groups like London Posses & Gunshot and a few others who sounded to me like they were from London, (my 1st name’s Kevin so being the youngest all the time I had the name Baby Kevin aka BK) but it felt for the most part that this was an American thing so when Jungle came it felt like it was more our thing, MC’s with their own accent etc, the UK Hip Hop I heard where people put on an American accent never really sat well with me to be honest. In the area I was living in there was a pirate station and some of my friends I rapped with used to go there so they invited me and after a number of sessions I developed a style that was more jungle MC than rapping and we were little hood stars on that station. It closed down after a few years then we managed to get on a ‘little’ pirate station in East London called Rinse FM where we had a slot and had shows along side the young Wileys’, Targets’ & Maxwell Ds’. After a while though I just lost the love for it & was hearing more Hip-Hop I was into with lyrics that I appreciated rather than Serbutio & Grand Prix lyrics. It felt like Jungle heads just wanted to hear ‘Budubudubudu’, not actual lyrics just rolling tongue so I was enjoying it anymore. How aware, how much of an influence was Stevie Hyper D to you? I knew him well enough that he would encourage me any time we saw each other. To me, him [Stevie] and IC3 were the best at what they did in that world. How influential were London Posse, Blak Twang, Roots Manuva? [I knew about] London Posse from before I even knew what rapping was so it runs deep with them. And when I started to be more aware I realised how prolific Bionic was, till this day I think he’s probably the pioneer of sounding straight UK but still maintaining a style none could touch. I heard about Twang more so than Roots in the early days but in our area MCD was the main influence being from West London also. I remember before I got really ill listening to a Silent Eclipse tape of MCD’s and thinking ‘WOW this guy sounds like he lives round the corner but his rhyming is on point’, from then on I just started working on how I could use my own accent which wasn’t too yardie or cockney but still sound cool. What do you think of the transition of Foreign Beggars from straight UK hip-hop to bass music? Not much man. I’m not really a bass head so I don’t know. If that’s what they want let them do it I guess. I’m not in to it but I doubt that matters anyway they’re having fun. What sort of influence did soul; jazz and funk have on you? Any artists? A lot, my neighbour was a sax player so I grew up with a lot around me, Miles Davies, Herbey Hancock, Pharaoh Sanders are names I remember being mentioned. I still listen to a lot today for inspiration. What was the album, artist or song that made you want to make music? (Most inspirational). Top 3 MCs of all time? Top 3 albums of all time? Most successful track to date? I don’t know to be honest but the 2 people talk about the most are ‘Around My Way’ & ‘Who You Gonna Blame?’ I used to base that question off which people talk the most about but now it seems it’s to do with how many people view it on YouTube. More LP’s and releases from my label Don’t Bizznizz and also a Radio Show/Podcast called ‘FDT Radio’ plus a BUNCH of material on my youtube.com/mysdiggi channel. Homeboy Sandman, Ab-Soul, Nathan Flutebox Lee. This entry was posted in Editorial, Interviews and tagged artist profile, drum and bass, jungle, mystro, rap, uk hip hop on January 18, 2013 by Jamie BC.